This course will explore the contributions of women artists to the western art tradition from prehistory to the present day focusing on the representation of sexuality and gender and the role of art in reflecting or constructing human identities. Visual language and art terminology will be used to examine a variety of artworks made by women from an assortment of historic, social, political and personal contexts. Because women have been traditionally underrepresented and generally discouraged from participating in the visual arts, students will develop a critical eye and learn to effectively utilize writing as they actively question the art historical tradition and thereby gain an advanced appreciation for the contributions of women artists in history. Synthesize strategies in critical theory to write analyses of artworks made by women. 7GC Global Citizen: allows students to explore the diversity inherent in our social and natural environments, including human diversity and world cultures. Students will work toward course objectives through: lectures; student reports on readings, active participation in class discussions; in class partner exercises; reading assignments; writing assignments; exams; viewing images, videos, and audio representations of art from the Renaissance to the beginning of the modern era; and viewing of an off-campus exhibition that will require a commute, and may entail a parking fee, and/or entrance fee. Additional essays will be posted to the Art 464 Assignments page at www.theslideprojector.com and exams will be taken outside of class on Blackboard at blackboard.chapman.edu. Students will be evaluated on the presentation of evidence that they have achieved the course objectives; on the frequency and quality of their contributions to in-class discussion; on their ability to make oral and written critical observations about the artists, movements, and concepts presented in the course; on the quality of the writing they present for homework assignments; and on their ability to demonstrate growth in their understanding and application of the history and theory of women’s contributions to the western art tradition. Students will develop descriptive and analytic skills through written assignments that are proposed and developed during the third week of class. Each student may propose a variety of assignments, or a single research project. All written assignments must utilize CMS (no Bibliography) footnote citations, and will be worth a total of 225 points. Students are asked to conduct a count on the participation and inclusion of women’s contributions to a grouping of your choice, and create an infographic offering details of the results that includes an analysis of equity issues demonstrated in the tally. For example, you might count the number of studies by scientists identifying as women referenced in your Biology textbook, or attend an exhibition and tally the number of artists included by their gender. If you would like your poster to be included in the Gallery Tally archive it must be 24 X 36 inches and include the following information (if relevant): the institution name, date, city, the year the poster was made, and the name of the artist/poster maker. The Count Infographic may earn up to 75 points. Students will demonstrate learning through two exams worth up to 50 points each, and taken outside of class on Blackboard page at https://blackboard.chapman.edu. Due to the nature of online testing, and the multi-day duration offered to submit, exams may not be made up. Please use the class schedule to plan accordingly. A final examination in the form of a Socratic Circle will be worth 50 points and will be conducted in class during our scheduled final exam period. Students are limited to earning 25 points in extra credit during the semester. Any points earned above this cap will NOT be applied to the final grade. Writing demonstrates excellence in both articulation and critical thinking. Art historical methodologies are used thoughtfully and with skill. Questions are answered thoroughly, and discussion is carried beyond prompt with sophistication. Credible scholarly sources are employed to support the author's position, and Chicago Manual of Style citation rules are carefully followed. The written assignment leaves little to no room for improvement, and demonstrates committed interest in the discipline. Writing demonstrates clear focus and an above average consideration of the subject matter. While all questions have been answered, there is room for improvement by carrying the analysis and discussion beyond a basic response to the essay prompt. Writing exhibits potential for excellence however, a clearer application and understanding of the art historical methodologies is needed. Author has met the requirements for research and citations with few errors. Thesis could be served by additional research. Most of the material is understood, but the focus is not entirely clear, and analysis is cursory. Question responses could be more fully realized, and the material, more thoroughly examined. Distracting citation issues are present, little research was executed in support of thesis, and/or sources are not credible or academic. There are issues with language that make the writing somewhat difficult to understand. Writing demonstrates little understanding or connection with the material and is flawed in content and form. Question responses do not provide evidence of critical thinking. Major citation issues are present, no research was executed in support of thesis, and/or sources are not credible or academic. Issues with language make the writing very difficult to understand. Conversation and debate will be central to the learning experience this semester. Art historians do not work in secluded spaces that are entirely disconnected from the world around them. Given the importance of engagement, students will be expected to fully commit to in-class dialogues and will agree to refrain from sleeping, texting, emailing, and completing out-of-class or other class assignments during Art 464 class meetings. Distracted students may be asked to leave class until their full attention can be directed to our course. Regular attendance is mandatory. You are permitted two unexcused absence without damage to your grade. More than two missed classes will potentially lower your grade, and missing four or more classes will put you at risk of failing the class. Please also be punctual! Students arriving 15 or more minutes after class begins should expect to be marked absent for the entire class. Letting the instructor know that you will be absent by email is always appreciated! Please understand, due to the large number of emails received, the instructor may not be able to reply. The instructor will maintain a simple record of attendance that will not distinguish between excused and unexcused absences. If you are not present, you are not able to participate. The circumstances that prevented you from being able to attend class do not change this. Please submit all coursework on Blackboard before class begins, on the day the assignment is due, whether you will be absent or in attendance. If you encounter a problem submitting on Blackboard, please notify the instructor via email as soon as possible and attach the completed assignment. You may submit one assignment, one class day late. The late assignment will not be marked down, however any assignments turned in more than one class late, or in addition to the one accepted assignment, will only receive credit at the discretion of the instructor. If you have been sexually assaulted, make sure you are in a safe place. Call 911 in an emergency, Chapman University Public Safety at (714) 997-6721 and, Chapman University’s Sexual Assault Information Line at (714) 744-7000. Contact Orange PD at (714) 744-7444. Why Have There Been No Great Women Arttists? The last day to add this courses is Friday, February 9. Students wishing to drop the course without record must do so by Friday, February 9. The last day to withdraw from a course, or change grading option to P/NP is Friday, April 13. The in-class final for this course is mandatory, and will not be offered at an alternative date, except under extenuating circumstances. The instructor understands that the end of the academic year and travel come with much urgency and pressure. Nonetheless, the hours set aside for the final exam are a part of your earned credit and as such, are an important component of your grade. Grades will be available no later than Monday, May 28. 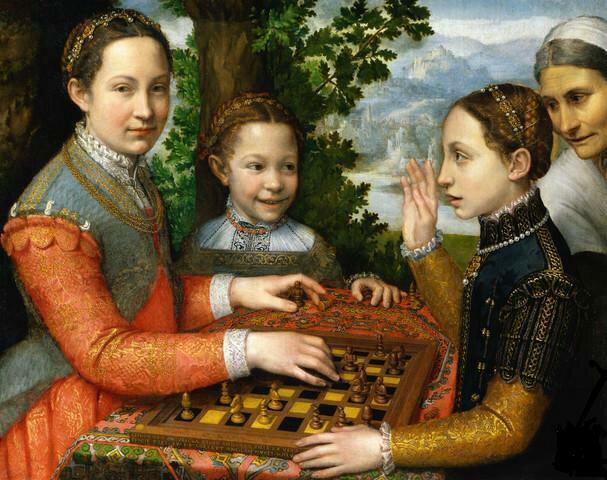 Sofonisba Anguisola, The Chess Game, 1555.